Where's Liz? 2014: Grand Canyon South Rim, Part 5...Last one. Grand Canyon South Rim, Part 5...Last one. One more post from the Grand Canyon, if you can stand it. We parked by the Pioneer Cemetery and took the Blue Shuttle to the Transfer Station. To get to Hermit's Rest you must take the red route shuttle, or walk. We walked part and rode part. Trailview Overlook gives you a good overview of the Bright Angel Trail. Lots of switchbacks. Ten miles down to Phantom Ranch from here. This was once a toll trail. Close up of the switchbacks. The next stop was Maricopa Point. But the view from this side has a history that remains. Originally a copper and silver mine, it became a uranium mine during the Cold War...a nightmare of radioactive contamination. This area is all fenced off with warning signs, and environmental testing is still going on. Well, maybe not completely rehabilitated. Battleship Rock. We were told a Condor nesting cave is there, but we couldn't find it. Powell Point honors early explorer John Wesley Powell. 100th Anniversary of that expedition was in 1969. It will soon be the 100th anniversary of the National Park. Rangers were here with viewing scopes and information about the Condor nest. The nest is not active this year, but it was last year. It's high on the wall facing you. Battleship Rock. Condors have to nest high on the cliffs. The fledglings have 700 feet to learn to fly. If the nests are lower, they don't have time to learn to fly. One year a young Condor chose a nesting spot too low on the cliff. The fledgling didn't survive. 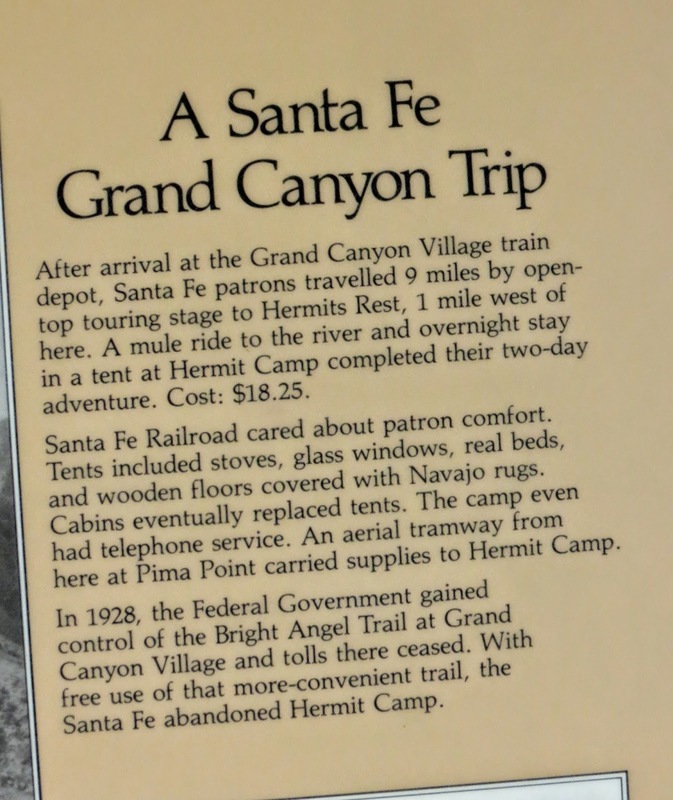 We can also see evidence of the first trans-canyon telephone line. There's another trail down there...not sure which one. Do you see the rest stop? On a clear day you can see Mt. Trumbell, 60 miles away. The next stop is called "The Abyss." Pima Point, just before Hermit's Rest gives you a view into Hermit Canyon. You can still hike Hermit Trail. What the excursion to Hermit's Rest was like in 1912. You can see some remains of Hermit Camp down there. Also from here some rapids on the Colorado River. We happened to catch some rafters coming through. First we saw these two single-person pontoon fishing boats far above the rapids. They disappeared out of sight. We waited a long time for them to reappear here, just above the rapids. They never did. Wide view of the river. Then we saw two power pontoon boats in the section where we saw the small boats. At first we thought they were rescue boats, but turned out to be tour boats. The power boats don't take as many days to run the canyon. They disappeared out of sight too. But they came through and ran the rapids. We figure the smaller rafts & rafters stopped for the night above the rapids. The tour group made it through fine. Last stop was Hermit's Rest. Another design by Mary Colter. I'm beginning to really appreciate Mary Colter's architectural and artistic talents. The hearth inside Hermit's Rest. In the morning on the last day we decided to "hike" part of Bright Angel Trail. We hiked a ways beyond the first tunnel. I say hike because, while it was a stroll going down, it was a hike going back up. Birdie coming through the tunnel. We turned around before the switchbacks. And heeded all the warnings. Now we are off on other adventures...Death Valley and more. Those drop-offs are killers! I'd be like Birdie....not too close to the edge.